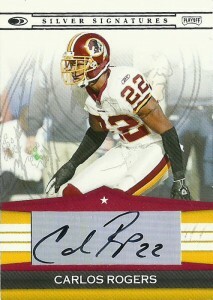 Carlos Rogers is an NFL defensive back who currently plays for the revamped San Fransisco 49ers defense. After a banner career at Auburn where he won the Jim Thorpe Award and was named a consensus All-American in 2004, Rogers would be drafted by the Washington Redskins with the 9th overall pick of the draft. Throughout his career Rogers has battled back from injury, breaking his thumb and tearing both his MCL and his ACL. He’d play for the Redskins through the 2010 season, finishing his tour of duty with the Redskins notching 312 tackles, 8 interceptions, 4 forced fumbles and 1 touchdown. Overlooked by clubs looking for defensive help, while coveted Nnandi Asomugha and Johnathan Joseph would fly off the board, Rogers quietly signed with the 49ers. Immediately he’d step into a lineup for a weak San Fransisco defense under rookie head coach Jim Harbaugh, and help provide a steady hand in the secondary that turned it into one of the best units in the NFL. Rogers exploded in 2011 and had 52 tackles, and 6 interceptions for 106 yards and a touchdown earning his first Pro Bowl appearance. He’d re-up with San Fransisco again in 2012 for a 4 year contract.